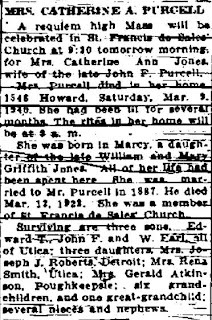 In my last post, Catherine Jones Purcell, the Orphan from a Big Family, I uncovered that many in Catherine's family believed her to be an orphan, but I was able to uncover that she had in fact, been one of five children born to William Jones and Mary Griffith Jones of Marcy, NY. As I mentioned in my last post, Fultonhistory.com is an invaluable source for information from old newspapers from all over NY state. It has been an invaluable source for my research. I can't count how many obituaries and newspaper clippings I have found which have furthered my research. The searching of the newspaper database can be tricky. A lot of it is trial and error. Here is how I typically do a search and then conduct variations from this search until I narrow the number of responses down to a manageable number to review. If you do a search for William Jones for example, you will receive thousands of responses. Far too many to look through. I suggest you narrow your search. My wife's relatives primarily lived in and around Utica, NY. So I conduct a boolean search. Where I outline the city and the person's first name adding w/2 (which means where the first name appears within 2 words of the following word) and then the last name. So it would look like the picture below. 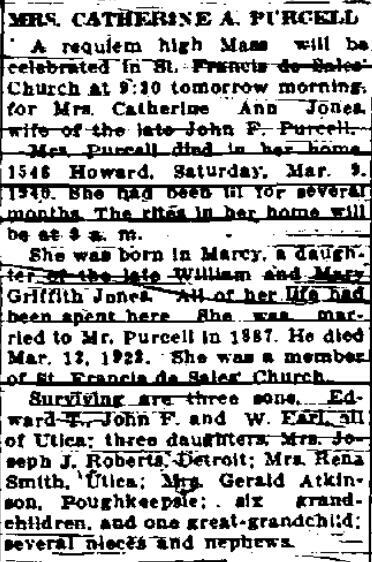 It is on a search like this that I uncovered Catherine Jones Purcell's obituary from 1940. I have been searching for her parents for about 1 year on the Fultonhistory.com website. I tried multiple different approaches, but with no success. I don't remember the exact search that I conducted the other day, but one of the results returned a death notice for Mary Jones. I didn't think much of it, but as I reviewed it, I saw that this was THE Mary Griffith Jones I had been looking for! I can't explain what I did differently on this search, but there it was. Mary Jones giving her death date as August 14, 1885. The death notice mentions all her children (Catherine is referred to as Kittie)....there was no no question that this is THE Mary Jones I had been looking for. 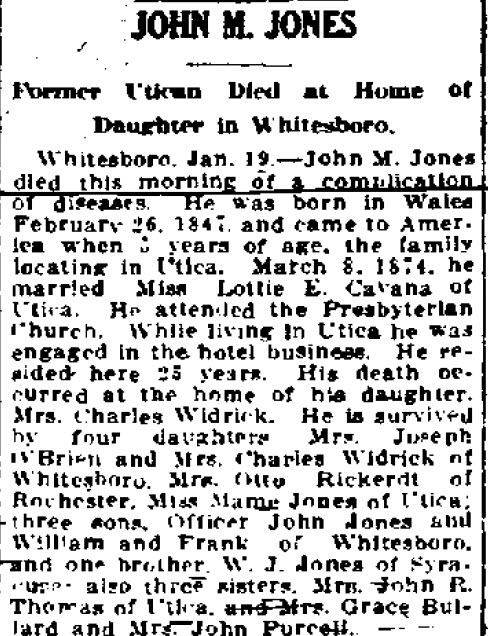 I was still unable to find William Jones' obituary after a year of trying. However, with the date of Mary Griffith Jones' death, I decided to check one of my favorite website to see if I could find where she is buried. I searched findagrave.com. I found her listed as being buried in Salem Cemetery of Marcy, NY. It did not have a photo of her tombstone, but had the next best thing..a transcription of the gravestone. Which reads "wife of William Jones age 60 yrs 2 months 19 dys". I know what you are thinking...it is very likely that William Jones is buried in the plot next to her. So I looked at all the William Jones buried in Salem Cemetery. There are three William Joneses buried there, but only one had a transcription which read "Age 51 yrs 9 dys". Which would have made him born around the date I had in my research. Also, his date of death was June 12, 1872. I knew he had died sometime between 1870 and 1880 (based on when he appeared in the US Census records). Everything matched up. Now we return to the idea of Catherine Jones and her time in an orphanage. Let's look at the information we have. Catherine was the youngest of the children. She was born Jan 1867. Which would have made her only 5 years old when her father died. The 1870 US Census lists William Jones' occupation as a farmer. It is unclear if he was farmer working someone else's land or his own land. At that time in history, the estate would have provided the land or property to the male heirs (or more likely the oldest male). I haven't found a Will. 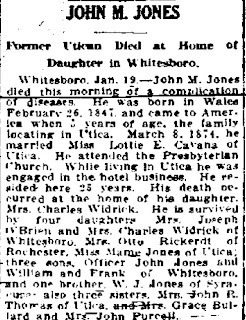 William Jones' oldest son was John M Jones. I am not sure if I have an accurate record of him in the 1870 US Census (he did not live with his parents and siblings in 1870). John married Charlotte Cavanaugh in 1874. His obituary states that he worked in the hotel business when living in Utica, but according to the 1880 US Census he is identified as a farmer. Was this his father's farm? Possibly, but It is unclear. The 1880 US Census shows Mary Jones living with three of her children: William, Grace and Catherine "Kitty". They are now living in Utica and Mary's occupation is "at home", but each one of the children are said to be "Working at a Cotton Mill". This included Catherine who was only 13 at the time. Presumably they were all working to support their mother and themselves. In 1885, when Mary died the kids would have had to fend for themselves. Each of Catherine's siblings were older (20's or older by that time), so they could care for themselves. Catherine was 18 at the time of her mother's death and unmarried. Did she spend time in an orphanage at this age? Seems unlikely. It seems more likely that Mary's son William either got married or moved away, which put the financial burden heavily on the family and this would have pushed Mary to have to put Catherine and/or Grace into an orphanage. If so, it is unclear how or why the other siblings such as John M Jones, didn't take her in. It would just be pure speculation on why the other family members couldn't or wouldn't take her in rather than her spending time at an orphanage. In 1887, Catherine Jones married John F Purcell. None of their kids ever spent time in an orphanage. 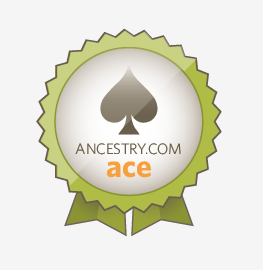 The curse of genealogy research is a common name. No question about it. The more common the name the more difficult it is to research your family. My wife's great grandmother, Catherine Jones, was my big challenge. She married John F Purcell in Utica, NY June 23, 1887. Her parents were unknown to my wife and her mother. 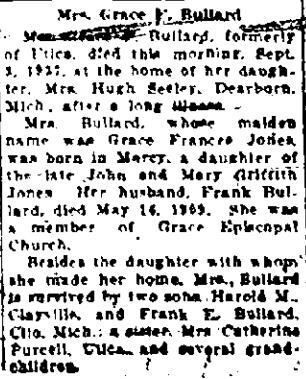 In finding Catherine's obituary (3/9/1940), I learned that her parents were named: William Jones and Mary Griffith Jones. Catherine was born in Marcy, NY and I knew her family was originally from Wales. Knowing that her parents were from Wales actually sounded like a great clue. I was unfamiliar with that area of Oneida County, NY and assumed that being Welsh was fairly rare. To my surprised, I learned that Marcy might as well be called little Cardiff (the capital of Wales). There appeared to be dozens of Jones and Griffith families in Marcy and the surrounding area. Family lore indicated that Catherine Jones Purcell has been orphaned at a young age and lived in an orphanage. Which would mean it would be nearly impossible to determine which of the many Jones families belonged to her. a William Jones in Whitesboro and another of her children had a wedding shower thrown by a cousin Maude Bullard. I started looking for other Jones family members. If you have relatives who lived in New York, Fulton History.com is an invaluable website. It is a collection of scanned newspapers from all over NY State. Searching the website can get tricky, but with an infinite amount of patience you can find almost anything that exists in the newspapers they have archived. I started conducting some searches on "Catherine Purcell" and "Jones". Which lead to me uncovering Catherine's 4 siblings: John M Jones, William J Jones, Eleanor "Nellie" Jones and Grace Frances Jones. William J Jones - William was born in Marcy in 1854. I haven't uncovered much about him except that he did live in Syracuse and possibly Whitesboro for a time. Eleanor "Nellie" Jones - Nellie was born in Marcy, May 1858. She married John Richard Thomas on Nov 25, 1874. Graces Frances Jones - Grace was born in Marcy in Jan 1862. She died in Deaborn, MI Sept 3, 1937. She married Frank M Bullard in 1885. Catherine had 4 siblings and over a dozen cousins, so how did she end up in an orphanage? Or did she? I haven't found any evidence that Catherine lived in an orphanage, but all family stories have some basis in fact. Today, we tend to think of an orphanage as a place where young children go when their parents have passed away and are wards of a religious or government institution. What I have learned in my research is that orphanages sometimes had another purpose. When parents we unable to financial provide for children, children would be sent to the orphanage. Sometimes for years. The fact that she spent time at an orphanage has survived in family lore tends to indicate that it left a negative mark on her.